Pretty Fly III was sold to China’s Chief Executive of UBOX, Wang Bin in November and renamed. Crew is a mix of Chinese and French, some from the successful VOR Dongfeng crew, including Charles Caudrelier (a past Solitaire du Figaro winner), Pascal Bidégorry, Thomas Rouxel and Jiru “Wolf’Jang. Wang Bin, who has sailed around the world twice, found his offshore racing inspiration from the Dongfeng campaign and this is the result, and this crew will spearhead the next Dongfeng VOR campaign. The language barrier aside, on paper this crew on the sistership to 2013 Hobart winner, Victoire, is a strong contender for the Tattersall’s Cup. 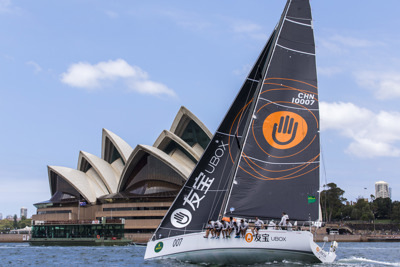 Wong Bin skippered the first Chinese yacht to complete a world circumnavigation and his crew raced on the Swan 82, UBOX in the 2016 China Sea Race and finished 20th overall. The campaign is to showi the way for other would-be Chinese offshore racers. They are one of two Chinese entries this year, alongside Ark323, and will race in the same division. As Pretty Fly III, was one of 31 retirements from last year’s Hobart, after breaking her forestay. She finished 44th overall and won Division O in the 2014 Hobart and 10th in 2013 for second in division. Best result was fourth overall in 2010 and second in Division 0.